BEIJING - Tests reveal clothes by well-known sportswear brands contain a hazardous chemical that can inhibit male sexual development and cause early female development. 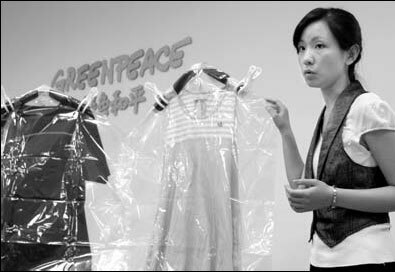 The non-governmental organization, Greenpeace, purchased 78 pieces of clothing and shoes manufactured by 15 brands from 18 countries, and tests revealed that two-thirds of them, including those manufactured by Adidas and Li Ning, a Chinese sportswear brand, contained the chemical nonylphenol ethoxylates (NPE). The items were produced in 13 countries, including China, Thailand and Indonesia. NPE transforms into nonylphenol (NP), which interferes with sexual development by simulating estrogen. "Medical research shows that indications of NP are higher in the body of precocious girls than they are for other girls the same age," said Li Yifang, toxics prevention campaigner at Greenpeace, an international environmental organization. Li said experiments have shown the substance can cause male fish to grow female organs at a concentration as low as 0.02 milligram per liter in water. "We should be aware of its hazards before scientists tell us how much it will hurt us and to what extent," Li said. In addition to its harmful affects on humans, the chemical is also a virulent poison to marine life. "The chemical is toxic to aquatic animals and plants, and even very low concentrations can kill fish," Li said. According to Greenpeace, all of the tested items produced by Li Ning contained NPE and all of them are produced on the Chinese mainland. Forty percent of tested items manufactured by Adidas contained NPE. Zhang Xiaoyan, the spokeswoman for Li Ning told the media on Tuesday that the amount of NPE in their products is in line with EU standards. While Adidas said in an e-mail to China Daily: "The tests show the concentration of NPE is well below the threshold value." Adidas also said that they have a restricted substances policy and their strict threshold is the best practice in the industry. However, Greenpeace said the clothing manufacturers are being misleading when they refer to the EU standard. "The number 0.1 percent refers to the highest permitted concentration of the forbidden chemical in manufacture, not the limit for residue on clothes," Li said. The organization urged the clothing manufacturers to make public of their use of toxic substances so that the public can better supervise the companies' practice of weeding out the chemicals. Li Ning Co said in a statement on its website on Monday that the company will reduce and eliminate its use of chemicals that pollute the environment in the next eight to 10 years.